It was a deserted, industrial area of Brooklyn and the only buzzer we could see on the door read “The Hosiery Company.” No one answered when we rang. Stymied, my friend and I and the driver all pulled out our phones to try to figure out where we had gone wrong with the address. Just then a beautiful woman in a pale yellow dress stepped out of the car in front of us. “I bet you’re looking for the supper club I'm going to,” she said, pointing to an unmarked door halfway down the block. A new incarnation of the dinner party that has become increasingly popular in New York is the private supper club. The one I attended this past Saturday was catered by the Brooklyn Laundry and featured a six-course meal inspired by the recipes of Antonin Careme (1784-1833), a man widely considered to be the first great figure of gastronomy. (He worked as the private chef for Napoleon and the Royal family of France, among other notables of his time.) Saturday’s venue was the penthouse loft apartment of a charming young man who greeted us sporting a whimsical lace cravat, and whose name I should probably not offer up here, as technically speaking, supper clubs of this nature are more or less illegal. First there were cocktails on the rooftop--all made with Lillet wine. I had a delicious concoction with Hendrick's gin and orange peel and mint called “the Muse.” (Lillet is a very versatile cocktail ingredient. In fact I think Lillet Blanc is what vermouth always wanted to be when it grew up.) The 25 or so guests ranged in age from mid-twenties to mid-sixties and included a doctor, a lawyer, a web designer, a jeweler, a producer, and a painter. The high-ceilinged dining space was defined by thin gauzy curtains that blew gently in the breeze, creating a dreamlike, almost surreal effect. The lighting was a soft orange “Blanche Dubois” style which made everyone look good and feel cozy. My favorite dish was probably the “Cabillaud a la Hollandaise” (Cod with hollandaise sauce,) though the “Les Petits Vol-Au-Vents a la Nesle” (blue crab, sweet breads and morels in puff pastry shells) was perhaps the most interesting--even if it wasn’t served with rooster testicles, as it had been at Chateau Rothschild in 1829. The supper club combines the intimacy and comfort of a dinner party with the convenience of a restaurant and the conviviality of a bar or lounge--where you can mingle with strangers. (Add to that the exciting hint of the Prohibition Era, when you had to know which door to knock on.) Let’s face it: Few people can afford to hold a gourmet dinner for 25 people. This kind of “paid” dinner party allows folks to experience a little bit of the luxury enjoyed--at least by the privileged class--in eras past. And okay, I did not get to consume a soufflé flecked with pieces of gold, as I might have at a Careme dinner in 19th century Paris. But for 21st century Brooklyn, the evening was, I must say, superbe. The live classical music in the background added to the surreal experience. Fortunately Careme started his career by knocking on the door of a restaurant for a job...a good thing it it wasn't a shoe store. 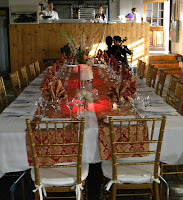 Having attending the feast on Saturday nite, and having cooked (as a hobby) many many dinner parties with multiple courses, usually with 4 to 10 couples as guests, I had a great time and commend ..and recommend.... the Bklyn Laundry for an enjoyable evening. The food was well prepared and each course was paired well with wine. (I can't even begin to think of the calories from just the alcoholic drinks consummed). I enjoyed the course that had a hollowed out a slice of baguette which was stuffed with quail and bacon, then fried in butter. A B&B theorm: everything that's cooked with bacon and butter taste great...this was no exception. It was a fun nite of eating and, of course, mingling. reading your blogs makes me wish I lived in NYC so I could savor those great moments with friends and strangers.